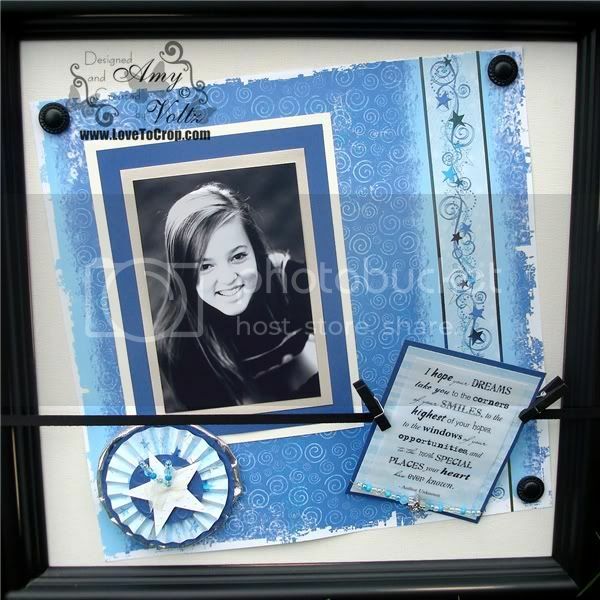 I started with an Everyday Display Frame from Creative Memories... The backboard is magnetic so that you can quickly change the layout to match your mood, a theme, the season or holiday... We have several of these displayed around our home -- It's fun to change them and see how long it takes before anyone notices (trust me, when it comes to pictures of themselves, they notice pretty quickly!!). I absolutely LOVE this quote... I strung the beads on thin wire and attached it to the bottom of the quote. While this could easily be added to the layout when I transfer this to The-Girl-Child's album, I will probably create a journal and add this to the front of that instead (I can always add another copy of the quote -without the beads- to the layout, or I can simply add another photo or two -- the choice is up to me since this display board allows for me to move things around and change things up!!). I really like this idea, very cute!! Your project is so beautiful! Thanks for stopping by my blog and leaving such nice comments this morning. So happy to be designing with you! beautiful amy what a great idea on being able to change out the background. your daughter is very beautiful and wish her the best. I forgot to say thanks for all the comments you left for me, and by the way you can't be Snow White and a mermaid too, lol. Wow!! This is amazing! Just love it. 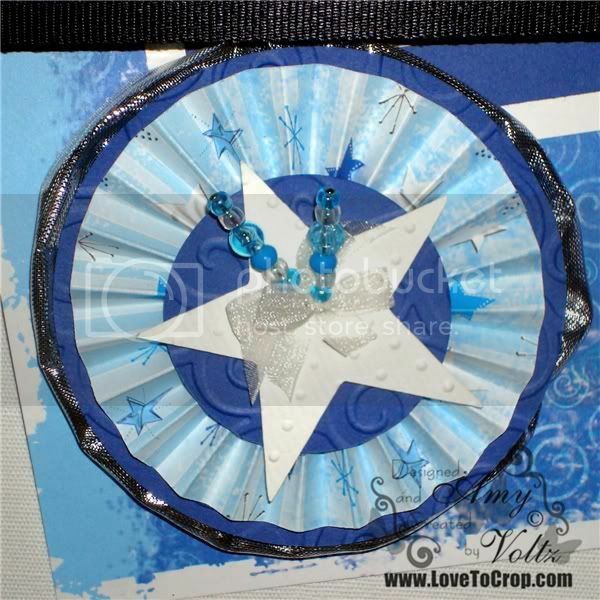 Your rosette is amazing, with the embossing on the star and the beads hanging from it!!! Hi Amy,what a beautiful project(and daughter).I love that the base is magnetic and you can change it round. The rosette and pins are amazing and how lovely of you to encourage others to visit us newbies. Really pleased and looking forward to working with you at CTO. Oh Amy! I love this! You did a wonderful job! Nice take on the challenge. Very beautiful. Thank you for the matting tip. This frame is so adorable! Love your layout! Its great to be on the design team with you. WOW! 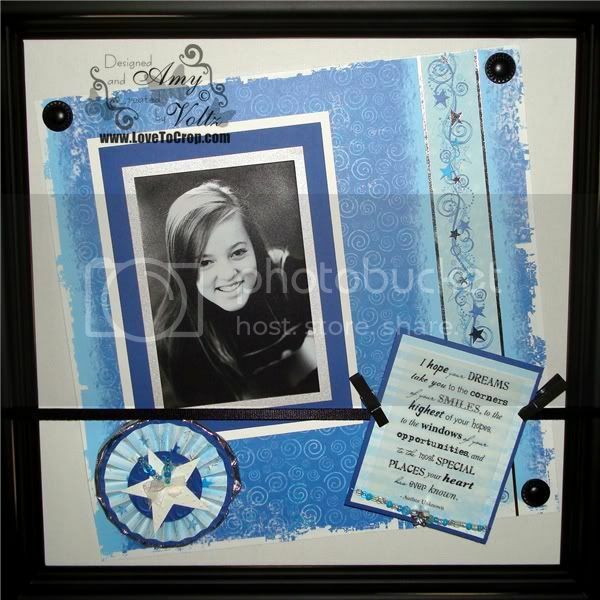 What a fabulous framed layout! The blue and white are great and I love the quote words! Amy, I enjoyed reading your post. i love the idea of waiting until August for the graduation party. This is a beautiful project. Your daughter has a beautiful smile and it just makes the LO POP!! The poem is just the sweetest. And the many different fonts used make it even more so. i love rosettes. A wonderful touch, they always make. As you can tell, all in all, I just love this!!! Hi Amy! So sweet of you to include me in your post! Glad you enjoyed my pin tutorial! I just used some pins today on a project I will be posting in a few days! Your project is super great! Love all the fun details! Amy what a beautiful layout.. great job.. I am glad you put the close up pictures so we can see all the wonderful details that you put into this project. Love that you used a B&W picture. Very cute. Amy, this is gorgeous, great job on the challenge. This is gorgeous Amy, I love the entire color combo too. What a grand idea of being able to change it out, I guess they would notice if it was about them. What a beautiful project. This would make such an awesome gift! Great job~Absolutely beautiful!! 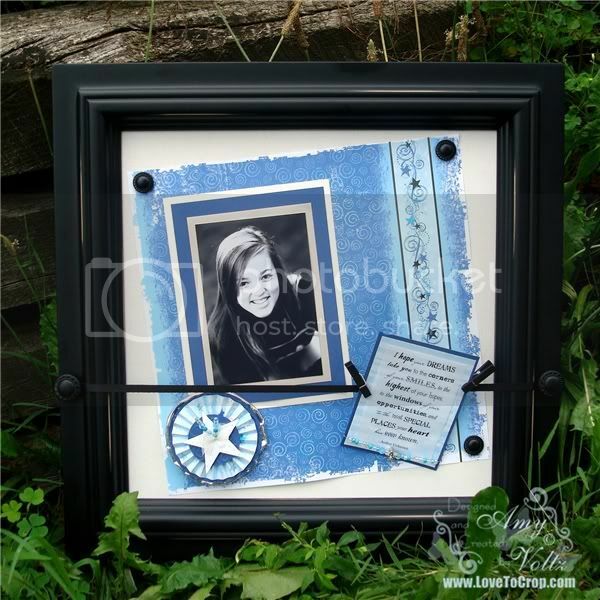 Very pretty picture frame, great job as usual! Bee-utiful project. Like the rosette stick pins. Like the chance to win one. cool' one now, Ha! The rosettes and instructions are great and I love the stick pins! I am going to have to try to 'win' one!! Love this!! It's absolutely beautiful! So happy to be joining you and the rest of the CTO team!